I have decided to run these two book reviews together as I don’t have a lot to say about either of them, though that’s not to say I didn’t enjoy them. 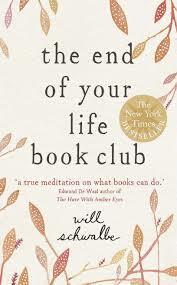 I liked The End of Your Life Book Club more than I thought I would; as a rule, I don’t like ‘inspirational’ books (I must be the only woman to hurl Eat, Pray, Love across the room in despair) and I had erroneously assumed that this particular book would be mawkish, depressing and full of religious platitudes, but actually it was refreshingly pragmatic, thoughtful and well-written and acts as a love letter from a son to his mother whom he portrays as a strong, independent, hard-working, deeply caring and loving woman. And the central theme of how a shared love of books and a shared love of talking about books can bring people together struck a chord with me. Many of the books that the mother and son read and discussed together will not be going on my reading list, nevertheless it was interesting to follow their journey. Would I recommend it? Yes, I would. 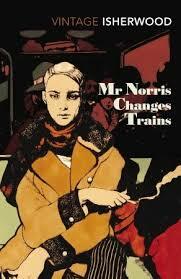 It was a little disconcerting to shift from The End of Your Life Book Club to Mr Norris Changes Trains, as they really couldn’t be more different. The first of Ishwerwood’s ‘Berlin novels’, there are no likeable characters in this rather slow-paced novel but despite that it still captured me. The lack of self-awareness shown by Norris, the arrogance displayed by both Norris and Bradshaw to all non-Englishmen they meet, the political conversations, the shiftiness of, well everyone; I found it all rather fascinating. I will definitely go on to read Goodbye to Berlin (once I have worked my way through the other 22 novels on my unread list of course!). Oh and I loved the cover of my copy, which is a Vintage edition! You are not the only one. I saw a book in the store with an interesting cover. I picked it up. As soon as I saw the words ‘by the author of Eat, Pray, Love’ on the cover, I put it down. Quickly. As if it might burn my fingers.